It is imperative that any organization know what their pay practices are so that they can make modifications if necessary to attract, retain and motivate employees as well as to insure that their pay practices are equitable and defensible. Job analysis is the systematic study of a job to determine which activities and responsibilities it includes, its relative importance to other jobs, the personal qualifications necessary for the performance of the job and the conditions under which the work is performed. An important concept in job analysis is that the job, not the person doing the job, is assessed. Job analysis is often confused with job descriptions, but the two activities are quite different. A job description is a written statement about the job. A job analysis is a systematic process that captures the entire job in compliance with professional and legal guidelines. A job evaluation is a systematic way of determining the value/worth of a job in relation to other jobs in an organization. Job Evaluation makes a systematic comparison between jobs to assess their relative worth for establishing a rational pay structure. Job grade is defined as a collection of jobs that are considered having the same value or worth for compensation purposes. The jobs that form a part of a specific job grade have similar job descriptions and requirement of knowledge, skills and abilities, thus making the pay scale similar for all those jobs. Conducting a job analysis is important because organizations are being asked to work leaner and more efficiently while developing growth and innovation. It’s important to be aware of the critical responsibilities for each position, especially those duties that are considered strategic in nature, and those that impact the customer and the bottom line. In addition to determining the critical tasks associated with each job, it’s crucial to identify the desired knowledge, abilities, skill sets and other preferred characteristics. Job analysis provides the needed data required to minimize legal challenges. Reduces risk for discriminatory claims, ADA complaints, DOL violations and penalties, improper FLSA classifications, and employee pay related grievances. Help solidify requirements needed for workforce and succession planning by matching future needs with current workforce. Proper Job Analysis and Job Evaluation is the foundation in ensuring equitable pay practices and minimizing the potential for legal challenges. Compensation Benchmarking is a key element in the creation of a company’s pay package. As defined, Compensation Benchmarking is the process of using internal job descriptions to pair to established salary survey jobs in order to identify the external market rate for each benchmarked position. In other words, benchmarking is the best way to compare key metrics to other businesses in your industry. The process of benchmarking allows companies to identify ways they can become more competitive in the industry while appropriately compensating their employees. There are many benefits to establishing a clear benchmark for the positions within your company. The success of your business is directly correlated to your employees, and investing in the best employees is directly linked to their compensation packages. That being said, the investment of knowing how your compensation package compares to your competition is an investment worth making. 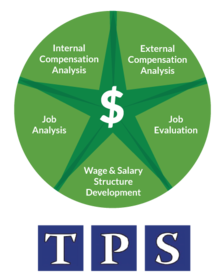 For Job Analysis Services & Compensation Benchmarking in CT, Contact TPS Group.